Tonny Jensen is one of the most promising young guards in the NBL today. After representing Australia at the Atlanta Olympics Jensen's form in the NBL has only improved, lifting his scoring average to over 20ppg and taking control of the team. He was an All Star and one of the most explosive offensive talents around in 1997. The Falcons didn't have a pure offensive scorer when it comes to their imports so Jensen had a lot of opportunities to shoot. He improved his already potent jumpshot and is now tipped to take over the Australian Boomers off guard spot when Andrew Gaze retires. Jensens NBL career was not always so rosy. 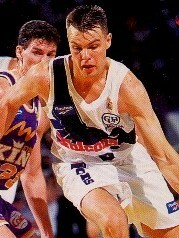 He played two games for the Sydney Kings in 1990 and then in 1993 found a job up north with the expansion Suns. Jensen averaged almost 10ppg but he was still released after the season. But the Falcons were quick to snap him up and he repayed their faith averaging 11.4ppg 3.1apg and 3.7ppg. Jensen was playing almost forty minutes per game. His numbers increased every year since and in 1995 he was selected to his first All Star game. He impressed there and his play for the Falcons only got better. In 1998 he will look to take an even bigger responsibility for the Falcons and help them reach the Play Offs for the first time since 1995.